Was sentenced to death on June 5, 1987 in Madison County for the murders of Jim Brandenburg and Wayne Hatch on January 28, 1987 in Madison County during a grocery store robbery. 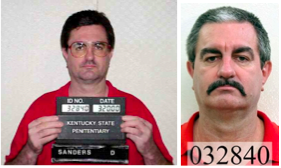 A jury found him guilty of double murder more than 20 years ago, and today the Kentucky Supreme Court upheld David Lee Sanders' death penalty. The convicted killer had challenged the effectiveness of his attorneys and the appointment of a special judge in his case, but in a unanimous decision, the high court ruled against all those claims. It was January 1987. Wayne Hatch, known as Bud by his loved ones, walked into Jim Brandenburg's Madison County grocery store just to visit. That's when David Lee Sanders killed both men. Since his conviction, he's spent the last two decades on death row. "David Sanders, now I think he's fifty years old now," Bud Hatch's brother, Ed said, "My brother didn't get to live to be fifty, and I sure would have liked to have my brother around, so I could have gone fishing with him more and had some good times with him." Ed Hatch says his brother Bud was the baby boy in a military family that grew up in World War II and saw all three of its sons serve their country. "He was just very friendly," Ed Hatch said of his brother, "He loved his wife and his children." The grocery store where Bud Hatch was murdered is long gone, but it was here that Ed Hatch says his brother came to kill time, so his wife could sleep after he had volunteered to work an overnight shift as a favor to a friend. When asked what he would like to see happen to Sanders, "There's evil in this world, Ed Hatch said, "I think the capital punishment is one of those methods that protects us against evil and against murderers... "Yes. I think David Sanders should pay." It's taken 20 years for a decision from the Kentucky Supreme Court. Oh dear. and type in David Lee Sanders, you can find the current decision. If you read it, you'll see that his direct appeal was actually resolved way back in 1990 by the Kentucky Supreme Court. Unfortunately, they have allowed him to drag out his post-conviction (habeas corpus) appeals since then. Even still, 20 years for post conviction appeals is insane. Now all the issues he brought up first time round are going to be brought up in the federal courts where the process will drag out for even longer. I can't see this case getting resolved for a long time. I can't see this case getting resolved for a long time. Well he has to go through the federal system with about 20 years worth of appeals that have been filed in the Kentucky supreme court and the federal courts can take years to reach a decision especially if you get some judge who doesn't make a ruling for years. In today's United States Supreme Court orders, Sanders' petition for a writ of certiorari and motion for leave to proceed in forma pauperis was DENIED. On October 20, 2003, Sanders filed a habeas petition in Federal District Court. On June 21, 2016, Sanders' habeas petition was DENIED in Federal District Court. On July 19, 2016, Sanders filed an appeal before the US Court of Appeals for the Sixth Circuit.